Having a love for paper often goes along with a desire for a simpler, minimalist life. That is true for me and I have enjoyed reading several blogs that focus on personal development, simplicity, decluttering, and minimalism. However, try to define all of that and you run into problems. Some of the blogs I once enjoyed in this sphere I have dropped all together because I saw a hypocrisy that didn’t sit well with me. Some of these bloggers became “celebrities” within their niche and quickly became everything that simplicity, to me, was not. I moved on to others. However, I have watched with a curious eye the latest developments among bloggers in this simplicity/minimalist niche and what I have seen is not the least bit pretty. What is simplicity to you? What is a “minimalist” life to you? It is now a bone of contention among several of the “minimalist” bloggers just how one must live to meet their definition of “minimalism” or “simplicity.” Most are reasonable: You scale back until you are comfortable with what you’ve done. Get rid of a lot of junk we may have carried from place to place, clean out the closets with clothes not worn in years, empty the garage of things stored but never used, etc. To me, I am perfectly comfortable with that level of simplifying my life. But…welcome to the days of Complicated Simplicity. Blogs, ebooks and now, even published books preach the rules of minimalism. What many of them have done is to take all simplicity out of the idea of simplicity and replace it with rigid rules and “recommendations,” on how to simplify. Some take it so far as to say we should all strive to live with a certain number of items. Some of these bloggers decided 100 items (!) was the sweet spot, only to decide that was too much. Yes, they were true minimalists because they were now living with 50 items. Then, one particular blogger decided even 50 was too much and on and on it goes. To me, this sounded like scarcity rather than simplicity. Now, we are being told that books are something to get rid of. Ruthlessly! Keep only books that are, “Desert island books.” Before, it’s always been along the lines of, “If you think you might have too many books, think about donating some of them.” Things have changed. I have noticed a downright hostile attitude toward books from some “minimalist” bloggers. In fact, I read a blog post yesterday that almost made it seem that if we wanted to keep all of our books, we deserved a diagnosis that you might find in the DSM-IV. Try this: “Honor your emotions. Your sentimental attachment to your books is not something to feel ashamed of or sad about. Acknowledging your emotions as you sort through your books can be the first step in helping you move past that attachment and towards a more minimalist reading habit.” All this complete with tips on helping us break this “attachment” to our “reading habit.” If a book has been on the shelf, unread, for 6 months – the advice? Get rid of it! Obviously, the author of the blog post, as well-intentioned as she may be, is offering blanket advice to do what she would do. Have some of these bloggers never heard of a personal library? (See picture above and click to enlarge. It’s very nice and I wish it were mine!) 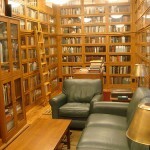 The Personal Library – dedicated rooms to books and a fireplace. Or, simply, a wall of books. Or how about an office surrounded by books? 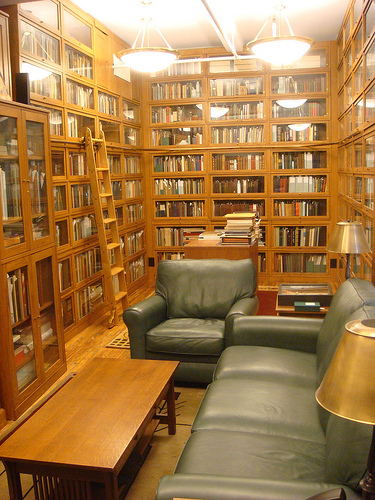 The personal library has been around since the printed word has been around. I would like to have seen somebody try to explain to Thomas Jefferson that he needs to deal with his “emotional attachment” to books. It’s all gone too far. Many simplicity/minimalist bloggers are also keen on ebooks, being affiliates for each others ebooks and marketing this whole idea of “minimalism” with such flourish that they have made “minimalism” something akin to the latest get-cash-quick scheme (simply, of course). I say, “enough.” I have dropped several of these blogs from my feed reader because I don’t want to read how what I have done to simplify and minimalize isn’t quite good enough. Some have taken it to such an extreme that they castigate those who dare have enough that they might burn an extra light bulb for too many hours in the day. Many of them connect themselves to the most radical of “green” groups that they go so far overboard as to be laughable, yet they fail to see the humor in their zeal. This may have been harsher than I intended. I’m just tired of constantly being told I’m not doing something “right” because I’m not doing something the way some blogger is doing it. In this case, simplifying. Ironic, huh? The joy of simplifying and trying to live a more minimalist life is caught up in debate over how many things a person should own and how we should keep our book shelves limited to “desert island books.’ The post about books and the “emotional attachment” was just too much. Misplaced zeal. For the record, I say, Long Live Books. I hope they are around far longer than blogs suggesting we suffer from some psychological disorder if we choose to maintain a personal library! Simplicity has become much too complicated.